Dr. Marilyn Easter, a professor of marketing and decision sciences, presents on her course redesign during a faculty and staff recognition luncheon hosted by eCampus on April 21. During eCampus’ Faculty and Staff Recognition Luncheon on April 21, select presenters shared the way they have collaborated to enhance the curriculum in their course work in support of student success. Posters around the classroom where the luncheon was held showed some of the techniques used as part of the CSU Proven Course Redesign Grant and the university’s Quality Assurance Grant. “We will highlight the work of staff and faculty, and hear and see what they’ve been working on,” said Jennifer Redd, director of eCampus, noting that theirwebsite lists many of the services they provide. Dr. Marilyn Easter, a professor of marketing and decision sciences, and Prabha Chandrasekar, a mediated learning assistant, shared the ways they worked to redesign a Lucas College and Graduate School of Business introduction to marketing course with a goal of decreasing bottlenecks in the required course for students in their major. Bobbi Makani, a lecturer who also worked on the redesign, shared insights via a prerecorded video. Using the campus learning management system Canvas, they created easy-to-digest modules each week for the students that included an overview of the content, a video introduction from Easter, step-by-step instructions, a description of learning outcomes, reading and assignments, and a “check your knowledge” section. Each week, the students also had a chance to engage live with Easter. 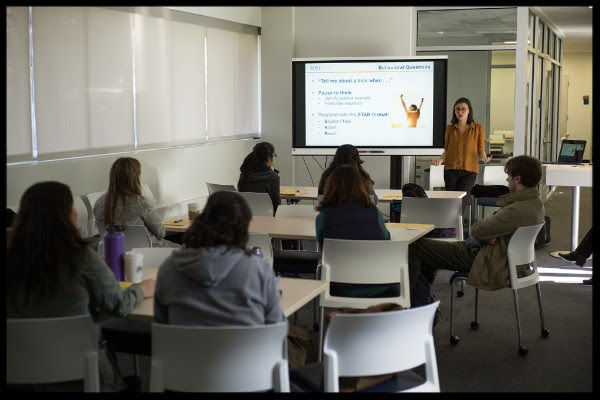 A student who provided a testimonial on video said that for her while working full time and taking courses toward an undergraduate degree, she sometimes struggled to get the courses she needed at times that worked for her schedule. 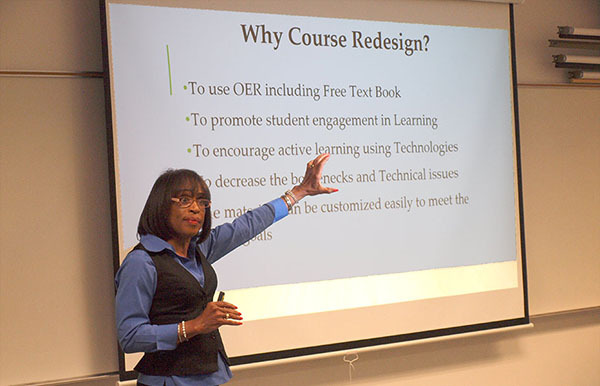 Dr. Easter’s online course fulfilled her time needs while also providing engaging material. Ravisha Mathur, an associate professor of child and adolescent development, and Debbie Weissman (via prerecorded video), a faculty member in the School of Information, discussed their experience as participants and more recently as team leaders with the Quality Assurance program. The program aims to evaluate the effectiveness of online courses and provides individualized mentoring to faculty to improve their online classes. Mathur, who is a peer reviewer this year, said the program helped her to improve student learning and engagement in the online environment. The feedback she received from students showed her that they preferred some lecture information in PDFs that they could download to read at times when they were offline. She now also requires a “meet up” twice a semester for her online courses, in which students can personally engage and connect with her in person, online or by phone; she has seen an improvement in student achievement and motivation with these meet ups. Resa Kelly, a professor of chemistry and the science education program, and Yingjie Liu, an instructional designer with eCampus, discussed their work on incorporating augmented reality (AR) and virtual reality (VR) equipment into a post-baccalaureate science teaching credential program course. The 2017-18 Quality Assurance application is available online, due June 18. Connie L. Lurie College of Education students gather in the Student Success Center for a career advice session. 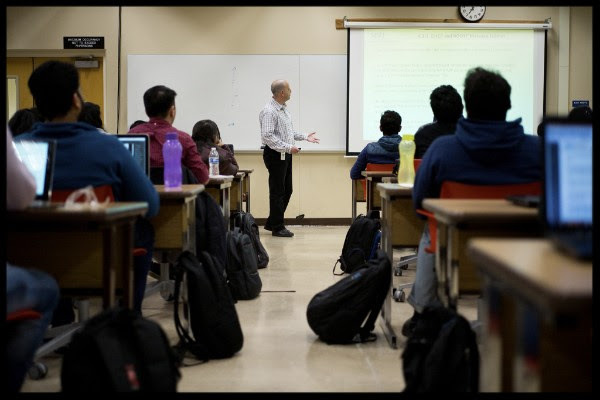 Technology continues to enhance more and more of the classrooms of San Jose State University. Outdated classrooms have transitioned into 21st-century learning spaces, one of the goals of the Vision 2017 strategic plan. More “smart” classroom are – or are scheduled to become – operational across campus during the spring semester. Modernization has been an ongoing project for several years within the Connie L. Lurie College of Education, according to Mary McVey, a former associate dean who directed the changes in classrooms and other facilities. She reports that with the installation of modern mobile furniture and “state-of-the-art” technology, 14 old-style classrooms have been converted into “smart” learning spaces. Added to those updates are a student collaboration lab, a faculty-staff meeting and professional development room, and a conference room. The newest of the facilities in Education, a Student Success Center (SSC), opened this spring. Whereas other colleges have utilized their centers for academic advising, Education will use its SSC for career counseling of its predominately-graduate level students. “Unlike the other colleges, two-thirds of our students are at the graduate level,” said Michele Burns, who is coordinator of the SSC for Education. “Most of our students are working on their teaching credential or preparing to become school counselors, speech pathologists and education administrators. In some cases, students will be able to check out equipment that includes a new supply of 75 iPads and five swivel cameras, mini robotic video devices that move to follow the instructor as he or she moves about the room. McVey indicated that the new technology will be used for communicating with student teachers who are working in the field as well as for professors to record lectures and provide students with supplemental information. Similar changes have been made in the College of Science, where “facilities, student seating and instructional technology renovations in classrooms include large lecture rooms in Duncan Hall 135, and Science 258 and 142,” according to Stan Vaughn, instructional and research facilities manager for the college. “Of special note is the work completed in Science 142, the largest and most heavily used lecture hall by our college,” Vaughn said, noting that three new projectors, a document camera and demonstration camera can now be used for multiple projections on three screens. Those devices are complimented by a new audio system in that room. Vaughn said that additional improvements for several other teaching labs in the Science Building are scheduled for use during the spring semester, with the Physics and Astronomy teaching lab in Science 319 being the first designated “active learning lab” in the College of Science. When completed, the facility will have new furniture, digital projectors, wall-to-wall whiteboards, sound attenuation, and modern window treatments to better control room lighting conditions. In addition to the technology upgrades, more than 150 classrooms were improved during 2014-16 with upgrades that included new blinds, whiteboards, projectors and other enhancements. Read more about classroom updates online.